We don’t need to introduce the famous Oludeniz. 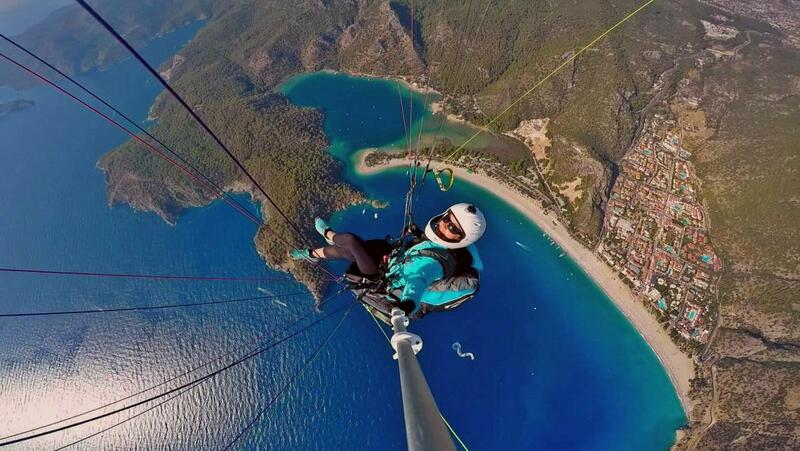 Oludeniz is a Mecca for anyone with a love of paragliding. Paragliders are a part of the scenery in the area. Each year, in October, Oludeniz features the International Oludeniz Air Games. It’s a Turkey’s biggest air sports event with paragliders from around the world. It’s not a competition, but a chance to be a part of an amazing event. The festival is open for all pilots, from amateur to professionals. Paragliders and other participants are flying off the Babadag Mountain, which is nearly 2,000 meters high. Along with paragliding, participants are also skydiving, base jumping, hangliding, engaging in para-motor flights and doing acrobatic flights. And all the time, the sky is completely alive with the vibrant colours of the canopies of paragliders and parachutes. Some pilots are solo, whilst others are doing team displays. The International Oludeniz Air Games are also a great end-of-season business for the paragliding companies who specialise in giving tourists the tandem paragliding experience. Thanks to the people who organize the event - best regards to our friend Kadri Tuglu - you can enjoy one of the kind paragliding experience. So if you want to see it with your own eyes, keep it in mind for the October 2018.